Mission Statement. Good ingredients, Great Service, Satisfied Clientele, and a Proud & Happy Staff. We at "Restau K Yamauchi" are proud of our establishment, and try very hard to project both a harmonious relaxing ambiance and fine dining experience for our distinguished clientele. 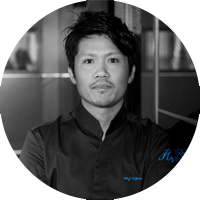 We are proud to be associated with the ever-evolving creativity and innovative techniques of Chef Yamauchi and his "Restau K Yamauchi" team. For us, every day is a new adventure, every day the quality and variety of internationally-select food changes, and every day, we hope to find new ways to please our customers in a manner that will draw them back to us when they reflect on fine-dining experiences. Chef Kenichiro Yamauchi, Head-Chef and Owner of "Restau K Yamauchi", Nagoya, Japan, graduated from the internationally renowned Tsuji Culinary School, Osaka, Japan, in the year 2000. His climb-to-the-top is marked by 14 years hard work and study, and personal tutelage and oversight by distinguished internationally renowned chefs: Chef Yashima of the Osuteria Enotekadaru Junjino Italian Restaurant, Kobe, Japan; Chef David Senia, of the "La Baie" French Restaurant, Ritz Carlton Hotel, Osaka, Japan; and Chef/Owner Kitamura, "La Grande Table de Kitamura", Nagoya, Japan. In April 2014, Chef Yamauchi opened the "Restau K Yamauchi", a high-end, French dining-experience in Nagoya, Japan. Available to choose 10-11 course menu as your lunch. You may move to a counter seat for a few dishes of the 10-11 course. ※An 8% tax + 10% gratuity charge is extra. Moving to counter seats for a few dishes that are included in 10-11 Course Menu (Maximum 5 counter seats are available at the same time). However, you may not be able to move to the counter seats depending on your booking condition (e.g. guests with time limitations, reservations after 20.30 or a group with more than 5 people). Ask our "Sommelier" about the fine wine selection we stock (French and Domestic) for your fine-dining experience. ２ Menu Choice(s)/Special Preparation Instructions e.g., food allergies, likes, dislikes, or substitutes to our menu choices can be considered. 3 Repeat-customer Dinning Experience(s) Considered. It is our mission to improve upon your previous dining experience(s) at "Restau K Yamauchi"; let us know how we can better serve you in the future. ※ Group or Private Party Reservations can be made up to two (2) months in advance. Our Reservations Desk is open from 0900-1030 and after 1530 until closing. A DEPOSIT is required to schedule a LARGE GROUP Event (15+ guests). VISA, Master Card, JCB, American Express, and Diners Club Cards are accepted. Cancelations/Full Refunds require 24-hour advance notice. Yes, we take reservations. They can be made via telephone (81) 052-222-6252 or by going to our web site and clicking on "RESERVE" found on the upper right-hand side of our menu on top. For our English-speaking clientele, we recommend using our Web Site. Cancellations: In order to provide our customers with the freshest and most diverse menu selections, we shop daily. Accordingly, we require a minimum 24 hours advanced notice to cancel or modify (pro-rate) a reservation (change in number of guests) and refund deposits. French Restaurant "RESTAU K YAMAUCHI"
Please send to our address your resume. Nagoya-shi, Naka-ku, Nishiki 2-12-21 Nishiki Kanaan Building, 3rd Floor "RESTAU K YAMAUCHI"
©Copyright by French YAMAUCHI All rights reserved.